Ferozsons Laboratories Limited has the distinction of being one of the leading companies providing treatments for Hepatitis patients in Pakistan for over a decade. Our work in the field of hepatology has been pivotal in changing the treatment landscape, initially through the local production of interferons, which reduced treatment costs by half, and subsequently through the introduction of Direct Acting Antivirals (DAAs) under a special access program in partnership with Gilead Sciences Inc. USA. In 2014, Ferozsons Laboratories Limited launched Sovaldi® (Sofosbuvir), the first DAA agent for the treatment of Hepatitis C under a special patient access program designed for Pakistan. More than 70,000 patients benefitted from this program since then. We have continued to provide treatment for various liver complications including Hepatitis C as well as cirrhotic complications due to advanced liver disease over these years. 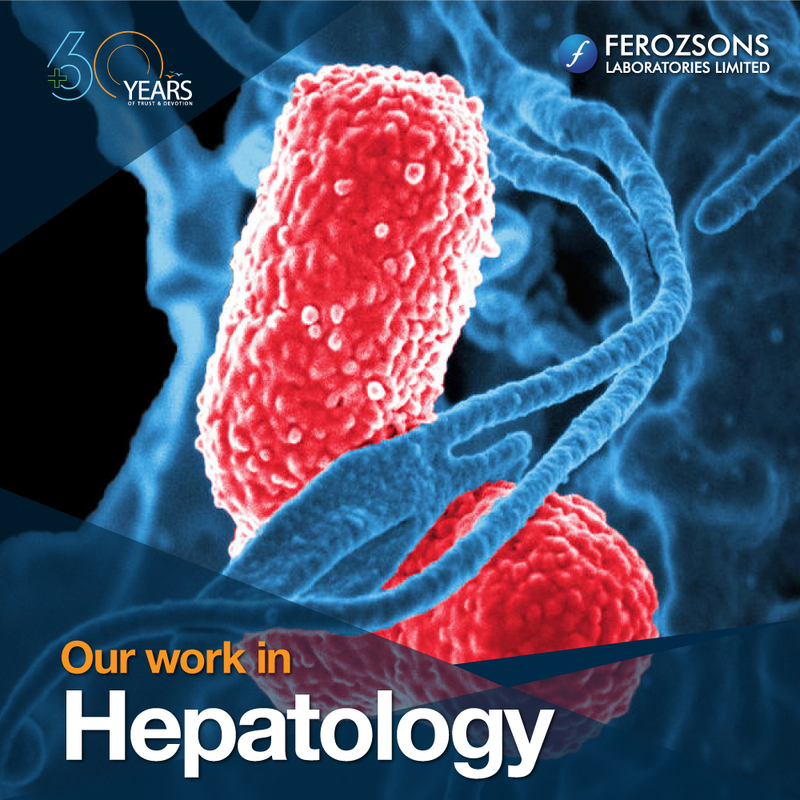 Ferozsons Laboratories Limited works hand in hand with healthcare providers and medical societies on a number of programs raising hepatic diseases particularly hepatitis awareness, and delivering education as well as facilitating screening activities. Our works include regular continuing medical education (CME) events that bring together top experts from Pakistan and around the world to explore the latest advancements in the field of hepatology. Ferozsons has also designed awareness and educational outreach programs around hepatitis awareness and prevention by creating alliances with local NGO’s and educational institutions. Hepatitis C is a blood-borne virus that can cause liver disease that ranges from a short, mild illness to a serious, lifelong condition. WHO estimates that approximately 71 million people worldwide have chronic hepatitis C infection and around 400,000 people die every year from it, mostly from cirrhosis or liver cancer. While there is no vaccine against hepatitis C, antiviral medicines can cure more than 95% of people with the disease. Pakistan suffers from world’s second highest disease burden in Hepatitis C with an estimated 10+ million people infected with the virus, according to a survey done in 2007 by Pakistan Medical and Research Council (PMRC). The prevalence rate is higher in peri-urban and rural areas where more than 65% of Pakistan’s 207+ million population resides. A large population of these Hepatitis C patients in Pakistan could have serious liver disease and many might be at greater risk of developing liver cancer. In line with Pakistan’s commitment at the World Health Assembly to join in the elimination of Hepatitis by 2030, the Ministry of National Health Services, Regulations and Coordination (NHSRC) has launched the National Hepatitis Strategic Framework in October 2017. Our continued commitment to introduce latest innovative treatment options and simultaneously work on awareness and education is in line with our patient-centric approach. At Ferozsons, we march ahead with this commitment to Pakistan and the markets we serve around the world.